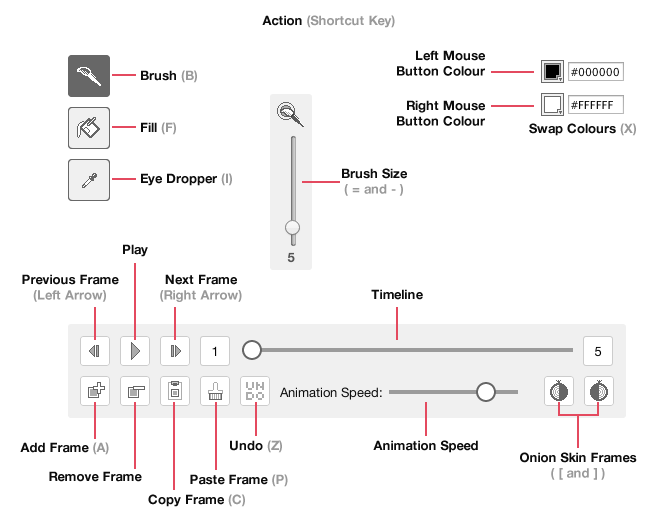 HTML5 animation application inspired by MacPaint, Deluxe Paint and MSPaint. GIFpaint is very much a work in progress, some things might break/change/improve in the coming weeks. Shortcut keys in GIFPaint are simply the keys, you don't need to hold Command or CTRL. Hold shift and click with the Brush Tool to draw straight lines. Multiple GIFs can be encoded in parallel, once encoded they are not saved anywhere so if you wish to keep them click Download or login to Tumblr and post them straight to Tumblr. If the tracing layer is visible when you hit encode, then it will be encoded into the GIF. Keep in mind the current GIF encoder doesn't handle photos well, this will be addressed in the future. Any JPG or PNG dragged to the canvas will be added to the current tracing layer. You can also use CMD+V on Macs and CTRL+V on Windows to paste the current contents of the clipboard if its an image. GPU accelerated 2D canvas causes errors with the Fill Tool with some graphics cards in Chrome. Type "chrome://flags/" into the address bar and check "Disable accelerated 2D canvas" to fix this and speed up drawing in general. Webcam captures look better with smaller canvas sizes.